This is a four-page chiropractic intake form and coordinated consultation notes, take less than 10-minutes for patients to complete. It takes a thorough history by using check boxes and short fill-ins. Plus, posting your paperwork on your chiropractic website saves time and tends to give you more complete information. We could have called it “Admitting Paperwork” or “Health History” but with today’s privacy concerns, it made sense to include the word “Confidential.” So we did. Not only does it collect the history necessary to get paid, it collects meaningful use data and ADL to provide a base line to measure subsequent functional improvement. Avoid denials due to a lack of medical necessity. Better reimbursement is around the corner. Abandon your current intake form immediately and implement an Intake Form that easily accommodates up to three admitting health complaints. Not only does our Intake Form integrate with the other forms in the system, it lays the groundwork for you to justify your services and substantiate your third party claims. We include a coordinating Consultation Notes document for making annotations during your consultation. More about this and how to use the other time saving features are covered in the implementation video included with your purchase. Most chiropractors don’t collect the right information or enough of it. Step up to a Paperwork System that reduces requests for additional information—because it’s already there! Upgrade and use the language and information third parties want and expect. 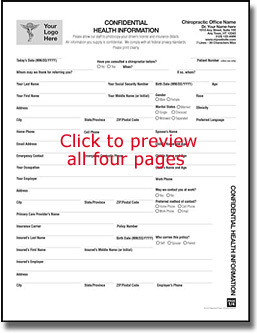 Order this form individually or the entire Paperwork System, personalized for your practice today. Join our mailing list to receive notification of the latest developments. With your pre-care history and consultation complete, it’s time to document your chiropractic examination.